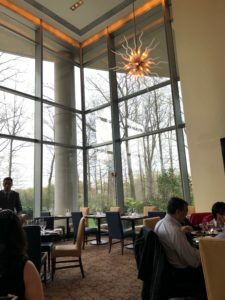 I can’t write about 2941 Restaurant in Falls Church, Virginia and not mention the juxtaposition of this high-quality restaurant against its location in an office park off I495. The contrast is particularly evident as I mistakenly land in the employee parking lot, forced to wend my way on foot through an office building until I discover a side entrance to the restaurant. 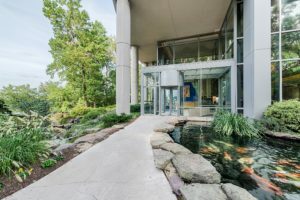 I completely miss out on the free valet parking and the front entrance to 2941, which is distinguished by impressive waterfalls and koi ponds. This is not my first visit here, but it has been far too long. Fortunately, it takes only moments – and The Bee’s Elbow’s cocktail- before I leave the office environment feeling behind. I immerse myself in the beauty of the view, from the floor to ceiling windows in the sophisticated dining room, to the artistically crafted food. If you follow fine dining in DC, you are most likely aware of 2941 Restaurant, which opened in 2002. Executive Chef Bertrand Chemel infuses contemporary American cuisine with French and Mediterranean flavors. 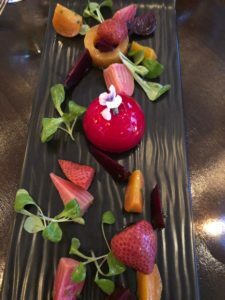 The restaurant recently launched its spring menu, and happily the weather has finally followed suit. The current menu grabs my attention with a springy selection of appetizers. I could make a meal of the starters and be perfectly content. A don’t-miss dish is roasted beets and strawberries with goat cheese mousse. I consider beets and goat cheese a pairing equal to meat and potatoes. Strawberries add a refreshing twist. This is as unpredictable and lovely as a beets and goat cheese dish can get. 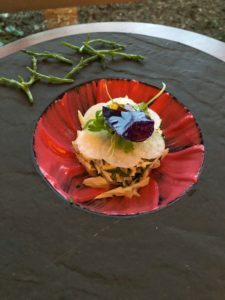 Crab Salad with radishes, raspberry aioli, lemon zest, and sea beans is another happy marriage of compelling ingredients. White asparagus velouté poured over ribbons of baby zucchini and green asparagus is silky smooth, and winningly shows off the season. 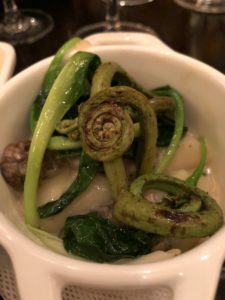 Is there anything more playful in a dish than fiddlehead ferns? They appear here with hand-rolled potato gnocchi and a toss of braised morels and ramps. Delicious. Goat cheese raviolini with its fricassee of peas, yellow chives, and oregano is one of four pastas on the menu- well worth a try. Order it as a half portion, and make room for entrees. Entrees extend the opportunity for Chef Chemel to show off the best the season has to offer. Sea bream, steamed stone bass, and wild Alaskan halibut are accessorized by seasonal vegetables like ramps, morels, and peas, and dressed up with smartly conceived sauces. Crescent duck is sweetened with Luxardo cherries, chicken en papillote has a basil broth, and herb crusted lamb loin is paired with asparagus, romano beans, and sauce au poivre. This section of the menu feels more traditional than the appetizers and pastas, but originality turns up in every dish. 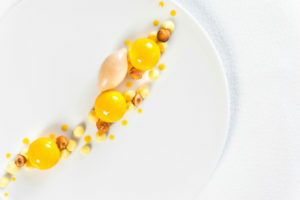 2941 Restaurant recently announced the appointment of Nicholas Pine as their new pastry chef. The 27-year-old Pine is a native of Rockville, Md. 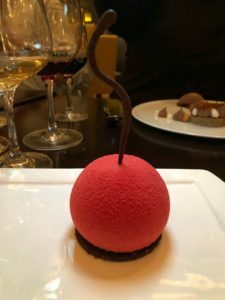 He has served as Assistant Pastry Chef at Co Co Sala in Washington, DC and as Pastry Sous Chef at Joël Robuchon and L’Atelier de Joël Robuchon in Las Vegas. Pine is creating playful desserts that fuse techniques, textures, and temperatures. He joins Chef Chemel in making the most of the season and in creating beauty on the plate. Cherry Bombe is a real looker. Chocolate sponge cake is filled with chocolate cremeus, cherry marmalade, and kirsch Chantilly- an explosion of flavor. A dessert titled “Exotic” combines tropical sorbet, coconut mousse, passion fruit caramel sauce, white chocolate pearls, and fresh mango. Rounding out the 2941 team is Sommelier Jonathan Schuyler, who expertly navigates guests towards ideal wine pairings. 2941 Restaurant is the place you want to park yourself down (but don’t self-park) and settle in for a supremely satisfying ride. Been There, Eaten That was a guest of 2941 Restaurant.